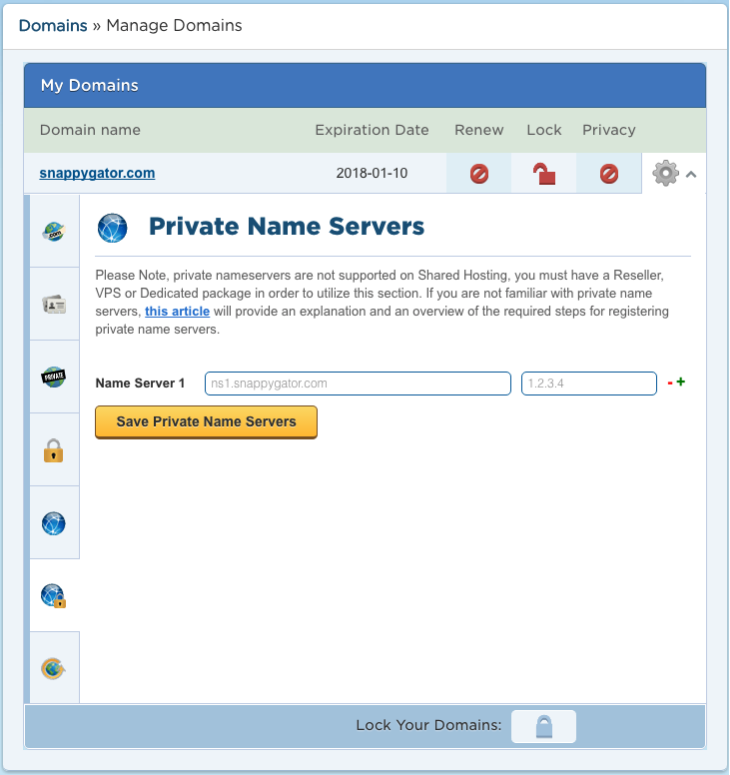 Private name servers are DNS name servers that are associated with a particular domain name, as opposed to being associated with those of HostGator.Your private name servers would be ns1.example.com and ns2.example.com, instead of nameservers with a HostGator domain. Private name servers can only be used on our Reseller, Dedicated and VPS hosting plans. It is not possible to use them on our Shared plans (Hatchling, Baby & Business). Click on the domain name that will be utilizing private name servers. Click the PrivateName Serverstab from the left-hand menu. On the PrivateName Serverspage, you can edit the name servers which the domain will point to. Use the + button to add additional rows and the - button to remove a row. Insert the private name servers and their corresponding IP addresses. It may take 24 to 48 hours to register your private name servers. Once your name servers are successfully registered, you can set all of your domain names to use the private name servers you registered. Like most name server changes, it will take an additional 24 to 48 hours (sometimes quicker) for this change to propagate and function. This delay applies to all domains with any registrar, not just Launchpad.